Excellent, somebody else in Toledo knows what the hell Virtual On is. DeepInTheHops wrote: Excellent, somebody else in Toledo knows what the hell Virtual On is. Awesome, right back at ya! When i was a kid,i went to my favourite arcade(now closed down) in the mall. I think i was 5 or 6 back then.I just fell in love with virtual on,once i sat down. I think the design of Temjin and Viper II was what drew me in to the world of Virtual on. When i sat down and inserted my coins.I held the twin-stick in my hands.And that was the moment Virtual on became a huge part of my childhood. By age 7 or 8 I became a veteran with operation moongate.Everything was self-taught for me.The jump cancel to get the target back on the enemy VR fast,the special attacks for my favourite VRs. I have force for xbox 360,but i am not a big fan of it,everything feels slow. The first Virtual-On game I played was VOOT on the Dreamcast. I had gotten it for Christmas from my father. I enjoyed it quite much. I played with a normal controller, I had never learned the name as a child so I went many years not knowing the name After I lost the game and my Dreamcast. Then When it came to XBLA I was overjoyed to find out that the game I had forgotten was now on XBLA. That was my first Arcade game for xbox 360. I had played it in arcades, but when I heard Force was comin to Xbox 360 it was a must have for me. I had unlocked all the VR's but 2 and then my memory unit screwed up and I had to start all over with VOOT and VOF. I came here to meet players and play because it is near impossible for me to get any games online. My first game is Virtual On Sega Saturn it was my cousin's game. My cousin, friends, brothers, and me play this game a tons. Later on got Virtual On 2 for dreamcast Even more amazing then the first. And still play it till this day. Recently got two saturn twinsticks(luckly got one of them new) and converter to use them on dreamcast as well. Playing both games with twinsticks is fun as hell and new experience. Only time i ever used them was like twice in a arcade about 14 years ago lol. I was going to get the xbox version until I looked and saw that they didn't have split screen BOOO oh well its not different from the dreamcast one really anyways. Well we always went to this little local game shop whenever we were going out. They would have system up and running of everything new at the time. One system had a Virtual On game. I loved the colorful graphics and the speed. Problem is I never got into Sega. 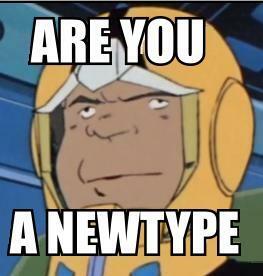 I saw Virtual On in XBLA, recognized it as a part of the series I played and bought it a few weeks ago. I still remember my mom trying to get me to look at Tomb Raider instead lol. I think I've been playing VOOT for 9-10 years now, and the entire series in total (from VOOM) for 13-14 years since the first cabinet came out in the arcades in the Philippines. It doesn't necessarily mean I'm a veteran, since in those years there were months that I haven't played at all and my skills rusted for a bit, and I'm sure people here were more experienced (and skillful) than I am or ever were. Anyway the first VO I played was VOOM on the arcade section of a billiard hall. Back then I think it was providence that I discovered the game when Gundam Wing was the rage when it first aired here, and that Virtual-On's mechanical designer was Katoki Hajime, the designer of the Gundams in GW. I played it for 3-4 years before graduating to VOOT in the last year of high school, and only made a serious effort in playing and learning it in the first year of college. I was able to find a few guys who had the same interests and we formed a VO club of sorts, which survived until today even though we couldn't hold matches in recent years because of the state of the arcade machines here that were broken beyond repair (or the technicians were just too lazy to order spare parts for). Before virtualon.net was taken down we were also active in its forums and challenged some outside teams for matches (though we were in Manila there were a lot of other teams in the surrounding cities). Zanyuki wrote: Before virtualon.net was taken down we were also active in its forums and challenged some outside teams for matches (though we were in Manila there were a lot of other teams in the surrounding cities). What was your handle on virtualon.net? I had the same... "MentholMoose". I think it was diamond_dust08 or something. And yeah I remember you MentholMoose. So 2-3 years after the release of VOOT for 360, here is my new impression. I was a big advocate of VOOM over VOOT, but not anymore. I cannot go back to VOOM because it feels so limiting now. In VOOT, there is SO MUCH FREEDOM. With skill and hard work, it is possible to make the weirdest move connect on your opponent. The other day, I finally landed Bal-bados's Tekken/Rocket Punch in a real match. The feeling was very satisfying since that move takes forever to come out! I have a strong Starcraft background which means I'm prone to pressing buttons as much and fast as possible. The Starcraft term is actions per minute (APM). VOOT can be a high APM game for people if they chose to play it that way <see Japanese leaderboard replays lol>. VOOM doesn't have anything remotely close to launching mines into bazooka into prediction laser cage all within 1 second. With the opponent often not in your view, a person begins to develop a 3rd eye. Despite not seeing the opponent, can feel where the opponent is relative to your position and what they are doing base on sound. I still prefer VOOM's brighter and cheerful backgrounds. The music, I put on mute. The music I was never really fond of, especially compared to what's available in other fighting games. 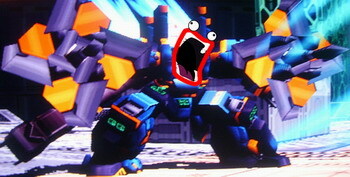 neoKEN wrote: I was enraptured by the photos of Virtual On OMG arcade. The game looked so beautiful in photo. Digged the mech design. Knowing it was by Sega mean at least there is some high standard of quality. Virtual On for Sega Saturn was an easy buy for me. Turned out it was greater than I expected. A lot of clear counter to specific situation. Suprisingly playable on pad. Lots of sessions in 2 player splitscreen. No brainer getting VOOT for DC. However, it was a disappointment for me when coming from VOOM. Aesthetically, a lot of the new robots looks like their came from magicland (angelican, spencif) rather than military. I hated the new look of Fei-Yen (How to make robots look underage). Environment looked so dark & drab and felt like it lost the bright anime look of the original. Sure the game has more polygon than the original, but it looked cheap. Even the presentation felt like it took a hit. Sound effects lost a lot of their oomph. Evasion seemed way too good for my taste when compared to VOOM. Matches in VOOM could end in few seconds while it was common to have timeout in VOOT. For me, VOOT was many steps forward for the series, but also went several steps back for me. I end up not playing VOOT as much as VOOM. Now that VOOT is out for XBL, I just want good competition to improve my gameplay. For me, having endless competition sure beats playing the same few people in VOOM. Thanks for the updated impressions! If anyone has any updated impressions / history, I would like to hear it too especially from those who are still playing. Updated history: Last week I decided to start playing Shenmue 2 again, it cost me a lot of (virtual) time and money, but I finally managed to grad all of the Virtual On figures in the game ! That damned BRADTOS was difficult as hell to find ! neoKEN wrote: I have a strong Starcraft background which means I'm prone to pressing buttons as much and fast as possible. The Starcraft term is actions per minute (APM). VOOT can be a high APM game for people if they chose to play it that way <see Japanese leaderboard replays lol>. VOOM doesn't have anything remotely close to launching mines into bazooka into prediction laser cage all within 1 second. With the opponent often not in your view, a person begins to develop a 3rd eye. Despite not seeing the opponent, can feel where the opponent is relative to your position and what they are doing base on sound. Hahaha, yeah, you definetly did but remember, there was moments where you failed to connect the combo or I practically avoided it. Overall, the chances of the combo actually connecting is still sketchy but I would say, at least, 50/50. Might as well use this to introduce myself as well as discuss my VO experience. This is how it'll probably be for me for a while yet. I'll just look on from here. Airrider1 wrote: Might as well use this to introduce myself as well as discuss my VO experience. Welcome to the forum! Do you own any consoles? If not, various VO games work in emulators.